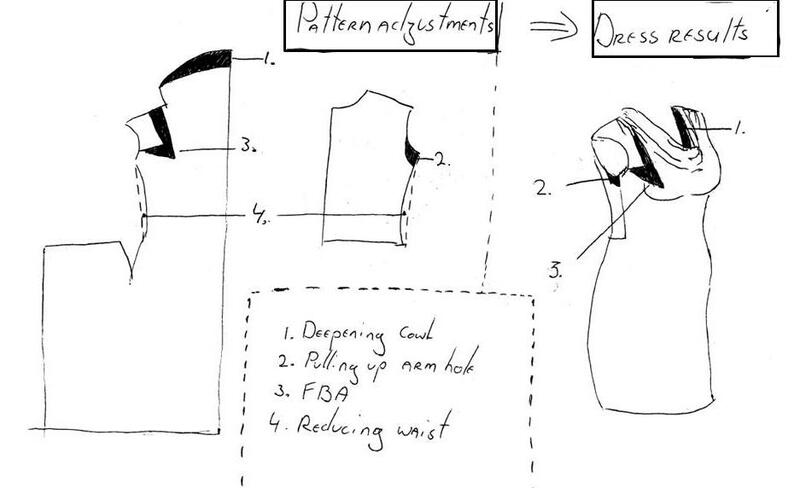 It’s no surprise that so many seamstresses are making this dress! 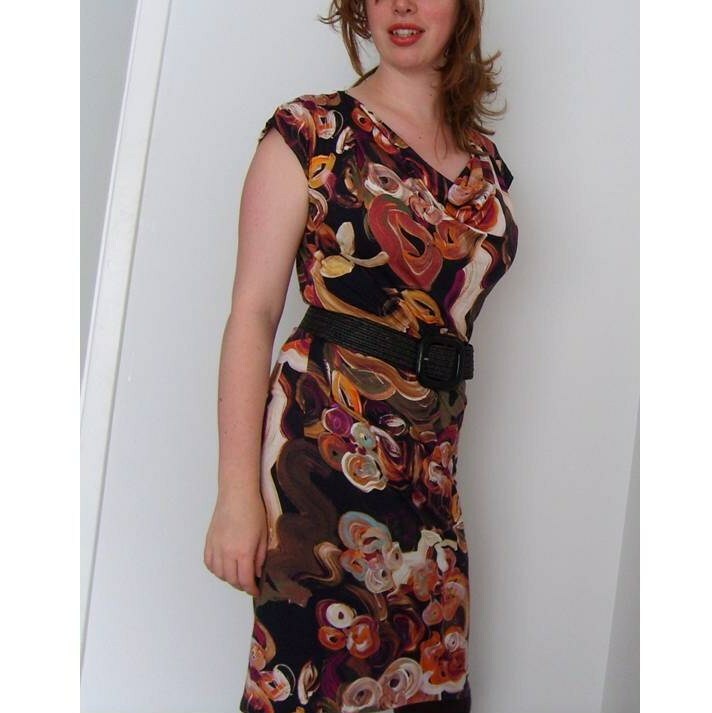 It's is very quick to sew, (one morning for me, including handseaming) and very flattering to boot! I’ve seen versions on hourglasses, rectangles, pearshapes, etc, and they all look great! I’m of the firm opinion that if you need a Full Bust Adjustment (FBA) in wovens, you’ll need one in knits as well for a perfect fit. 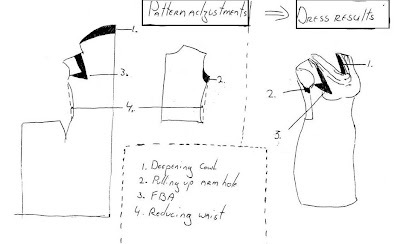 In this dress you can do an FBA without creating additional darts. Here's how. As the picture on the envelope shows, the dress is kind of wide around the waist. As I like a fitted waist, I took in the waist for a total of 6 cm, tapering to the original lines at hips and armholes. Those armholes are pretty low, so I followed the tips the sewing lawyer explains here, and raised the armholes and deepened the cowl. The seaming on the dress is very interesting; no side seams on the skirt, only one center-back seam, and no seams on the front between bodice and skirt part. 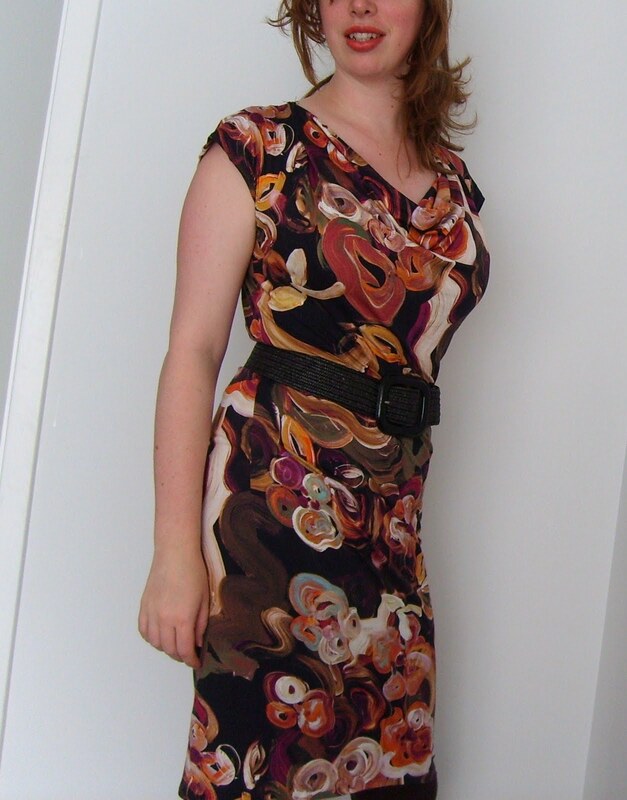 That makes this dress very suitable for big or weird prints, like this one that has big strokes and squigles in oilpaint all over. This dress gives you a lot of bang for your buck. Despite the simple design, it looks gorgeous on many different people and it’s easy to put together. No wonder so many people have made this pattern already. This pattern might become a wardrobe staple for me. Shortened, it will make a great top, and if you add sleeves, it will work for autumn as well. You won’t regret trying this pattern.